Liudmyla Yurina is a representative of the “middle generation” of Kyiv School of Composers. Her music is well-known in Europe and the US. Yurina often goes to the Western countries, brings to Ukraine interesting music projects involving both, composers who create new kind of music, and foreign musicians working in this sphere. Recently concert of Swiss-German duo of trombonist Dirk Amrein and pianist Jurg Henneberger (musicians played a musical piece by Yurina among other European music). Mrs. Yurina, in your opinion, is serious new music in demand among the audience? Now Ukrainian music is dominated by small compositions and small forms. Is this due to a lack of orders? Do composers have a need to make music of large forms? You teach composition at the National Music Academy of Ukraine. Do students choose their professor depending on the trend or style in which the master works? Please tell us about your training at Stanford University. 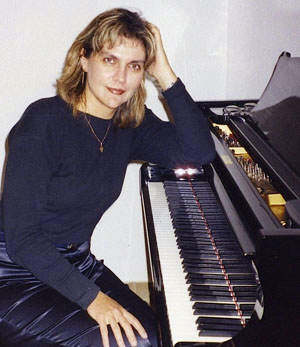 Liudmyla Yurina – composer, born in 1962 in Uzin (Ukraine). Graduated from the Kyiv Musical College (piano), Composition Department of the Pyotr Tchaikovsky Kyiv Conservatory. Defended Ph.D. work (class of Yevhenii Stankovych). Attended seminars held by Paul-Heinz Dittrich, Irvine Arditti, Helmut Zapf, Gerhard Staebler, Duran, Helmut Lachenmann, and Wofgang Rihm (Germany). Since 1993 member of the organizing committee and the coordinator of the International Forum “Music of Youth” in Kyiv. Since 1995 worked at the Composition Department, National Music Academy of Ukraine. Was a guest composer at the flute master class in Rheinsberg Music Academy (1999), lectured at universities in Germany and the US. Received creative residence and grants in Germany and Sweden. In 2010 received Fulbright scholarship for an internship at Stanford University (CCRMA, US). Yurina’s music is performed in Ukraine, Russia, Germany, France, the US, Canada, Italy, Finland, Poland, etc. She actively cooperates with well-known European and American artists. She has performed on radio stations Deutsche Welle (Germany), the Ukrainian Independent Radio (Chicago, US), Edmonton (Canada), Ukrainian National Radio, etc. Her music work was published by publishing houses Muzychna Ukraina and Frederic Harris Music Publishing (Canada).